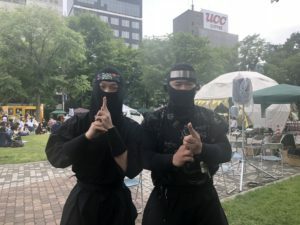 Ninja Garbage Picking in Odori Park | HOKKAIDO NINJA DO! 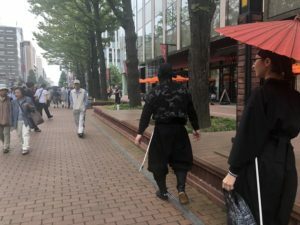 There are still some chilly days sometimes, but since summer is quite close and the events in weekend are increasing noticeably in Hokkaido. 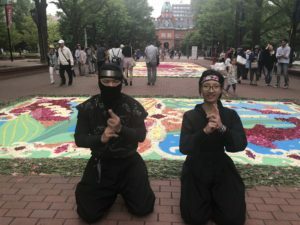 Ninjas from Hokkaido NinjaDo also went outside and held “Garbage Pickup in Ninja Style” at around Odori Park where is always lively every week! 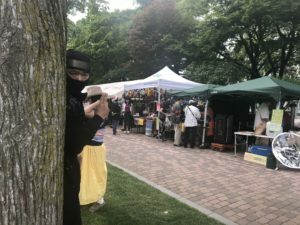 We sneaked into the venue of “Fair Trade Festa” which was held at Odori Park and the “Sapporo Flower Carpet Festival” in the north three street square in front of the Red Brick Office of the Hokkaido Government Office Building, We found garbage there and picked it up. 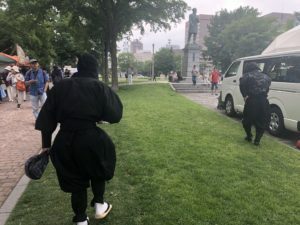 Sapporo is going to have more and more events from now on!